Medical Physics, Particle Therapy and Computing. If you read research papers, chances are you’ve heard the term open access. In this post I’m going to talk about what open access is, the state of open access in medical physics, and what medical physicists can do if they want to make their work open access using sites such as arXiv.org. The quick summary is: the primary obstacle to open access in medical physics is adoption by authors. Most journals are already on-board in important ways. If you want to make your medical physics publications open access, you probably can and I encourage you to do so. According to our friends at Wikipedia, open access is “unrestricted online access to articles published in scholarly journals”. Open access is generally placed into two categories: “Green” open access and “Gold” open access. Green access is defined as author “self-archiving”, when the author places a copy of a paper on their own site or on an e-print server. Gold access is free access provided directly by journals. While open access is strongly established in some disciplines, particularly physics, computer science, math, and earth science, medical physics seems to have lagged behind the curve greatly, especially in self-archiving. The above plot from Björk et al. 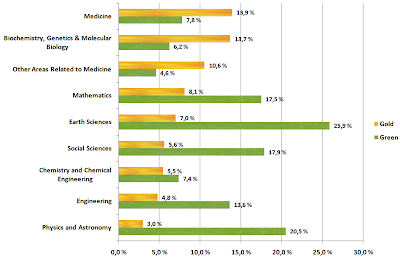 shows the percentage of publications that are made open access in different disciplines. In some sub-disciples of physics, such as high energy physics, the rate of self-archiving is up to 100%. For reasons unknown to me, medical physicists have not embraced open access, despite the supportive polices of medical physics journals (see lists below). I suspect that medical physicists are largely ignorant of the journals’ policies. If medical physicists want to provide open access to their work, they have options to both self-archive (green) or publish in open access journals directly (gold). In 1991, high energy physicists began self-archiving their publications on a site called the arXiv (that X is supposed to be like a Greek “chi”). Since then, the arXiv has expanded to cover all of physics, as well as other fields, such as mathematics and computer science. As the leader in physics self-archiving, the arXiv is a logical destination for medical physicists to post their papers. In fact, the arXiv has a medical physics category. Currently, the medical physics category of the arXiv has very low activity relative to the number of medical physics articles published that are eligible to be posted. (I plan to investigate the posting rates in a future blog post.) While the activity is low, it is encouraging to see prominent medical physics researchers, such as Steve Jiang (UCSD) and Thomas Bortfeld (MGH/Harvard), posting articles. (Thanks!) In fact, one tiny area of medical physics that seems to be very well covered on the arXiv is GPU based calculations in medical physics. That’s probably due to Jiang’s group leading the way in posting their publications. While medical physics journals all allow self-archiving to servers such as arXiv.org, medical journals related to medical physics seem to be much less enthusiastic about open access (see the list for details). The Elsevier journals allow pre-prints and self-hosted archiving, but the main radiology journals have open access “hostile” policies. The one thing that has seemed to crack journals such as those from RSNA is government mandates. One example is the recent rule requiring NIH funded research publications to be made available as open access on PubMed Central within 12 months of initial publication. This rule has had a wide ranging effect on journals and led to much discussion. Funding agencies in other countries have instituted similar rules. If you’ve published in medical physics journals, you can probably make your work open access right now by posting your articles to arXiv.org. If you are planning to submit an article to a journal, you should read the journal’s copyright policy before submitting and before posting a pre-print (or post-print). Some journals have very strange policies, unfortunately, and this has to be taken into account when submitting for publication. I encourage authors to strongly consider making their work open access, either by self-archiving to the arXiv or publishing in one of the gold access journals. Ultimately, the arXiv is just an example of an e-print repository, but it seems to be the best choice for now. If, for example, a dedicated medical physics repository were created and critical mass were achieved, the papers on the arXiv could be stored there as well. I haven’t discussed the concerns some people have with open access (see the Wikipedia entry). If there is interest, I might talk about that in another post. Below I will list the current (Jan. 2011) policies of the journals (as far as I can tell, UAYOR, YMMV, IANAL, etc). You can find out more information about the open access policies of these journals and others by using the SHERPA/RoMEO tool. Posting to e-print archives permitted with slight restrictions. In the US there seems to be a stronger protection of the copyright for the authors. If I understood correctly, a public funded researcher cannot transfer rights entirely to the publisher. In Europe there is no such protection, and in my field of research, a complete transfer of copyright to the publisher is normal. When a manuscript is accepted for publication, the author usually receives a standard "transfer of copyright" form which is to be signed, suggesting "take it or leave it". I have been told that these forms actually are negotiable, even if some journals may hide this fact from you... never tried this, though. Our university urges not to transfer copyright, however for open access publication some journals require a publication fee. I should mention that the main conclusion I drew, that medical physics articles are not open access, because authors are simply not participating, was not at all what I expected when I first looked into this. I had assumed that the journals must have had very restrictive copyright and those posting to the arXiv were pressing their luck at best. Turns out my initial hypothesis was almost completely wrong! MedDocs Publishers are dedicated to publish informative and professional journals covering (A to Z journals) various areas of science, medicine and latest technology. We follow open access policies.